What about this SUV concept/ crossover proportions reminiscent of a Nissan Juke and illustrated here by a single teaser? More than a future self that is supposed to prefigure the Intrado concept intends to showcase the evolution of style and design at Hyundai. More clearly, the concept Intrado (term refers to the aviation world) illustrates the Fluidic Sculpture 2.0 style. 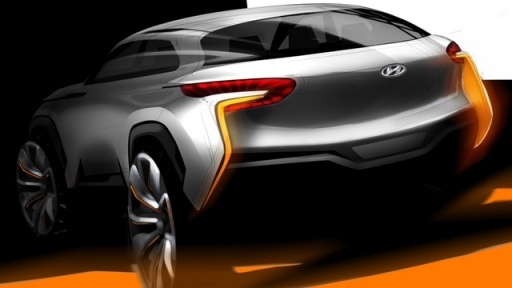 This concept was created by the European centre of Hyundai design based in Russelsheim in Germany (Hyundai Europe Design hence the name HED). The Korean manufacturer to conclude unveils and announces more before the next Geneva Motor Show. Note In conclusion that datasheet is globally shared with the Hyundai ix35 Fuel Cell but in an enhanced version.